When it comes to breakfast, Matt is unbelievably fussy. He doesn’t like eating bread in the mornings and he won’t eat anything sweet tasting or unhealthy. On weekday mornings, he’s also rushing around like a madman, so anything that takes too much time is a no-go. He does, however, love eggs more than just about anything in the world, so this recipe came about when I was trying to find something that satisfied all of his criteria. These egg muffins take no more than 15 minutes to prepare and cook just as quickly. They last for 3-4 days in the fridge and can also be frozen. So when Matt’s very lucky, i’ll make a batch on a Sunday night to get him through the working week without complaining. He just gives them a quick microwave each morning and they’re good to go. 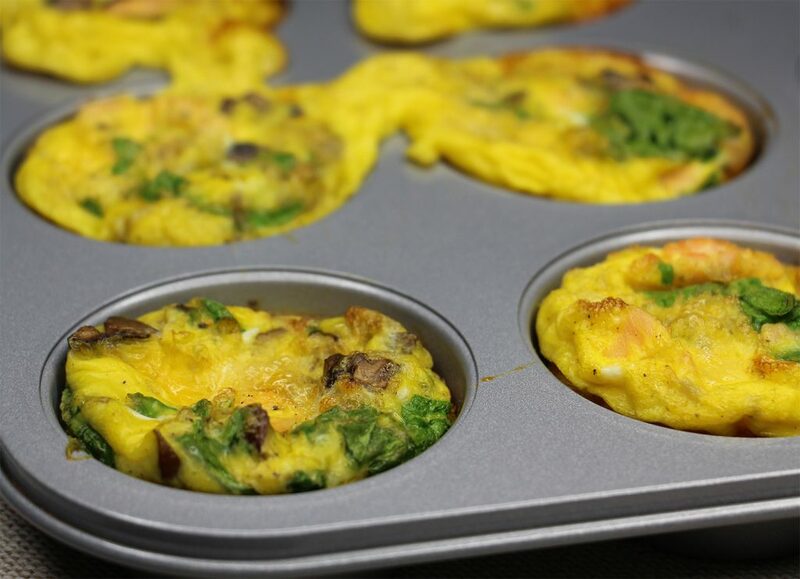 This recipe uses smoked salmon, spinach and mushroom as the main flavours, as they go really well together and keep your egg muffin low carb and super good for you! It also has the added benefit of being wheat and gluten free, so it’s perfect for anyone who is intolerant to these. Preheat the oven to 200 Celsius / 390 Fahrenheit. Heat a frying pan on a medium heat and pour in a glug of vegetable oil. Add in the chopped onion and mushrooms and let them sweat for around 3 minutes, stirring occasionally. Then add in the garlic and fry for another 2 minutes. Turn off the heat and leave the frying pan and its contents to cool on the side. In a large bowl, beat the 6 eggs, then add the smoked salmon in small chunks, the spinach, salt and pepper. Next, add in all of the ingredient from your frying pan. Finally pour the mixture evenly into muffin tray a place in the oven. They'll take around 15 minutes to puff up perfectly!. I’m not a salmon person, is there another meat I can substitute? What do you mean by smoked salmon, can I use the salmon in the can? Sorry is I am sounding stupid.